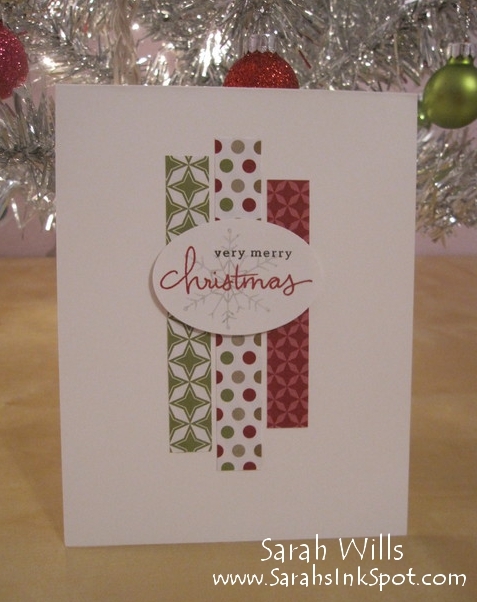 I used papers from Season of Style DSP which you can find on pg 23 of the Holiday Catalog – I love this pack of papers but if you want to get some, get it fast because this paper will soon be retired when the Holiday Catalog ends in just over a week’s time! That creates a very simply & quick backdrop to the sentiment. The sentiment…all stamps I used are from the set Endless Wishes…the snowflake was stamped using Smoky Slate ink – now to get an image that I could stamp over and which would not be too strong, I inked up my snowflake stamp and stamped it onto a piece of scrap paper – without inking it up again, I stamped it again onto a piece of Whisper White – this gives a much paler image for the background. Isn’t that cute? 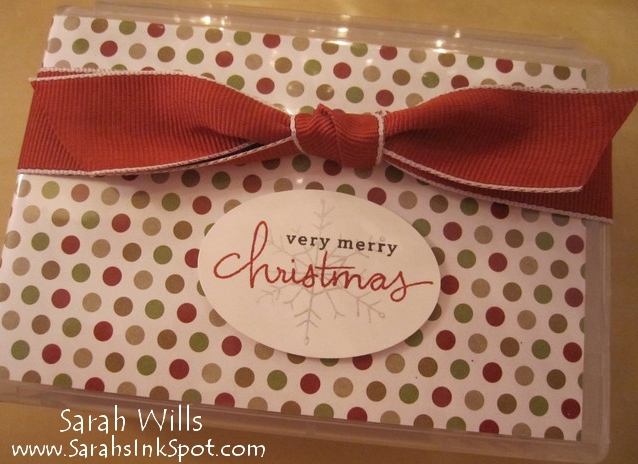 The box is a plastic Half Wood Mount Stamp Case that is decorated using patterned paper, a ribbon and tag – easy, fast & fun to make – and a great price at just $1.24 per box, you can use them for packaging a gift card for any occasion during the year! Click HERE to find these Half Wood Mount Stamp Cases in the online store – you get 4 in a pack for just $4.95! This idea is courtesy of Deb Snyder who was kind to show us this idea at Founders Circle in September – thank you Deb – the teachers loved them! To make them you simply cut a piece of DSP to measure 11 1/4″ x 3 1/4″ and slide it into the plastic case – easy & fast! 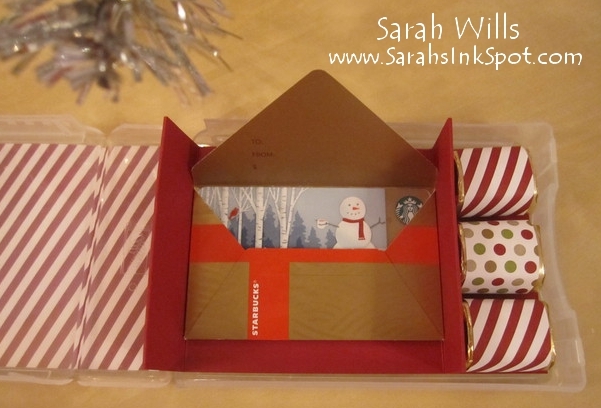 Fold along those score lines to create the shape you see above – you will end up with a large section to hold your gift card in place and a small section on the end that is perfect for holding 3 Hershey Nuggets or similar sized candies – yum!!! Once done, I tied around a piece of 1″ Stitched Edge Cherry Cobbler Ribbon and finished with a knot on the top and added a tag. I love the card! I have a bunch of strips left and I need a few more cards for tomorrow, you just saved the say. I have them all out still so I can whip these up in no time. I love the idea of using up the scraps. 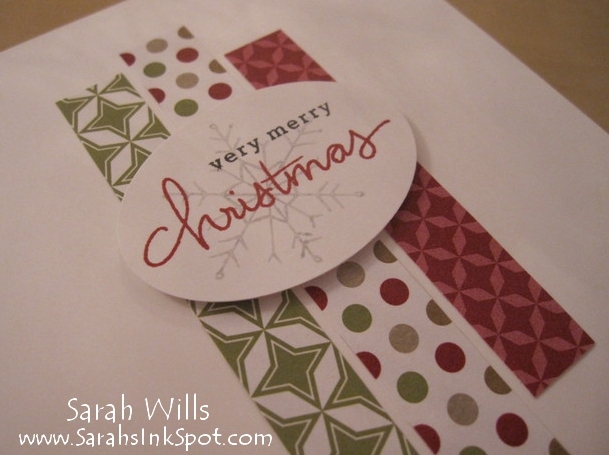 Plus, the little saying is cute esp with the snowflake stamped. Thanks!!! Have a great holiday season.